Ayurveda is made up of two Sanskrit words 'Ayur', which means 'life' and 'Veda', which means 'Knowledge'. To know about life is Ayurveda. According to the ancient Ayurvedic scholar 'Charaka', 'Ayur' is comprised of four essential parts, the combination of mind, body, senses and the soul. According to Ayurveda, the mind not only controls our thought process but helps us in carrying out day-to-day activities such as respiration, circulation and digestion. The mind and the body work in conjunction with one another to regulate our lifecycle. Maintaining the clarity of senses is an essential part in allowing the mind and body to integrate their functions and help in keeping us healthy and happy. Ayurveda believes in soul and its importance. Existing in a more subtle form before the existence of physical form is known as soul. The ancient Ayurvedic Acharyas of India believed in the energetic essence of soul over illness. In Ayurveda, a person, as a unique individual, is made up of five primary elements. The elements are space, air, fire, water and earth. The food we eat and the weather are just two examples of the presence of the elements. Treatment in Ayurveda consists of anna and Vihara prescribed jointly or separately, depending upon the illness and the state of the patient. The various methods of treatment offer both preventive and curative forms of therapy. The different types of treatments are elakizhi, njavarakizhi, pizhichil, sirovasthi, sirodhara, nasya, abhyanga, karnapooram etc. Ayurvedic treatments are best during monsoon season. Usually people are asked to do such treatments during rainy season because the atmosphere will be cool, moist and dust free during monsoon. This helps to open the skin pores and it becomes more receptive to herbal oils and therapy. 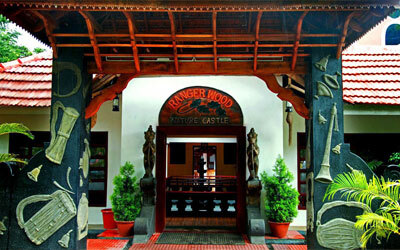 The Rangerwood Nature Castle Resort at Thekkady provides you with the best ayurvedic treatment in Kerala. The healing and massage therapies here at the 'Ayurthejas' – Rangerwood’s Ayurvedic Resort will not only refresh your mind but also your body too. Here you will get abhyangam, shirodhara, herbal steam bath, podikizhi etc. This Ayurvedic centre has two well trained Doctors along with 50 well trained therapists and also a pharmacy for the medical requirements. The treatments here range from a minimum of 5 days to 21 days, as per the doctors medication. They provide treatments for spine care, rejuvenation and body purification therapy, stress management, psoriasis, arthritis and so on. 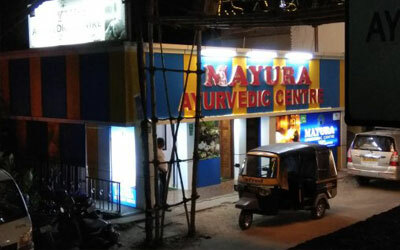 Established in 1994, the Mayura Ayurvedic Centre provides excellent treatment in Ayurvedic treatment and massage. 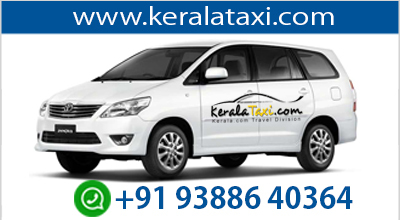 This group has centres not only at Thekkady but also at Goa and Munnar. This ayurvedic centre is working as per the government norms. The treatments here are Ayurvedic Abhyanga and Abhyangaswedam. Their services include doctor consultation and treatment fixation; neat and clean treatment rooms; experienced and well qualified staff and pharmacy for Ayurvedic medicines, oils and powders. They also have two in house doctors to take care of the consultations. Experienced and well qualified Ayurvdic consultants and therapists make Sahyadri one of the ideal spots for Ayurvedic treatment. 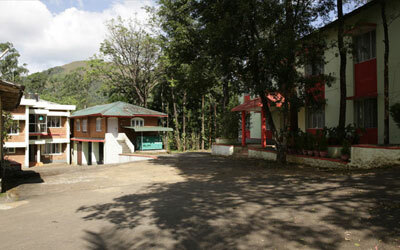 Sahyadri is a specialised Ayurvedic Panchakarma Centre, which is established in association with the department of AYUSH. It offers all traditional panchakarma treatments for curing chronic, lifestyle and degenerative diseases. This place is located at Pallikunnu at Kuttikanam, Thekkady and is at a height of 3000 feet above sea level. One of the best ayurvedic centres in Thekkady, Ayur Sparsh offers varieties of ayurvedic treatments like Pizhichil – continuous dripping of lukewarm herbal oils all over the body; Sirodhara – slow pouring of herbal oils on the forehead; Kizhi – herbal leaves and powders applied to the whole body in boluses; Medicated Steam Bath – Ayurvedic leaves boiled in hot water and the steam passed over the entire body. This place is located at Kumily, Thekkady. 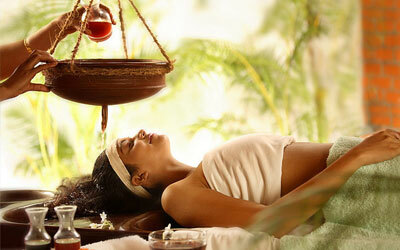 The Ayurvedic treatments offered here is guaranteed to relax and refresh your mind, body and soul.